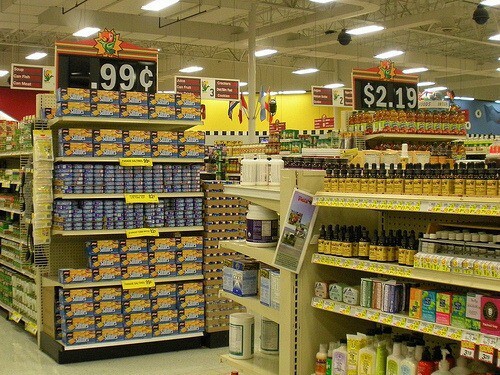 You are here:Home Shopping Grocery Specials: Are They Really Worth It? New reader Renee Wohl posted this on a local email list about saving money. A local chain was advertising 1+1 sales where you get two identical items for the price of one. Although there ARE sometimes good deals that can save you money at these 1 +1 and other sales, I’d like to remind all you savvy consumers that these ‘specials’ need to be examined very carefully. In many cases, the savings are minimal or non-existent. Chain Z is expert at making special packaging for these sales. Thus, the full priced product might be sold at X amount and the sale product at X-2, but if you check how much you get in the package (something like 500 g for the non-sale item), and you check the contents on the ‘special’ package (400-450g) you’ll often see that there is no savings involved. Sometimes, buying 2 packages of half the amount at the regular price, is cheaper than one double package of the ‘sale’ item. This happened to me recently when I found that 2 packages of 50 tea candles cost less than the large package of 100 tea candles. still give you a savings, but not as much as you think – especially on those 2 +1 free items. cash which is working for them instead of working for you, while you use up the 3 items. Thank you, Renee. Jonathan Bloom spoke about point number four as it relates to waste in his book American Wasteland. In England, the government encourages stores to offer “Buy One, Get One Later” along with a coupon. It would save the store money as a significant percentage wouldn’t bother. It’s also important to keep in mind that some specials can be helpful. “Loss Leaders” are good deals meant to lure you into the store for your weekly shopping trip. Often, a chain with consistently better prices is the better deal. Or rotate among stores to stock up on bargains. Cook Fresh or Freeze in Bulk? So funny, as I was *just* at the Dollar Store yesterday (which I rarely am), and I noticed they have aluminum foil, which I’m low on. I thought, “Hey! Foil for a dollar! Great!” Then I noticed that it was only the smallest amount (25 yards, or feet, whatever), and that it certainly would not have been worth my money. This is true, also the items on the bottom of the shelf are usually cheaper. Those at eye level are more expensive. Figuring out the price per ounce is essential to savings. The items on the end of the aisles are supposedly on sale, but be careful. I didn’t realize the British government is into the business of dictating coupon distribution..how orwellian. I don’t see how encouraging policies that discourage food waste is a violation of human rights. It saves money improves quality of life for everyone. I believe people are smart enough to figure these things out for themselves with out government interference. It seems the things they are charged to do they don’t very efficiently because they are so occupied with the minutia of the populace’s lives. It just struck me as being some what intrusive. You would think that ensuring the food supply is safe would be a big enough job to keep the bureaucrats occupied. Cynthia, the intent wasn’t to protect consumers–maybe it was confusing for me to bring it up in this context. Food that ends up in landfills is a serious public problem. As far as I know this was a government agency working with retailers to help them become more aware of the issue. Most food-waste prevention measures will save retailers money too. Bringing the topic up in this context didn’t confuse me, I simply feel that this is not the government’s business but the consumer’s and the retailer’s business. Adding a layer of government bureaucracy to “oversee” everything adds unneeded expense to the cost of doing business and products. Thank you, I enjoy your postings. the problem with unit pricing are things like toilet rolls where the supermarket says, 100 sheets at 35cents per seet. but when you actually look at the different toilet rolls some are 2 ply, some are 3 ply, some are 10cm by 11cm, and some are 9cm by 10cm. You really have to be a canny shopper! Good grocery stores put the non-sale price on the sign. Sometime you are only saving $0.02. In America, if you see 10 for $10, you can still buy 1 for $1. In Israel, you have to buy however many specified. If you don’t buy enough to get the sale, the check-out girl may remind you of the sale, but sometimes they don’t know how much to charge you if you only want one. Something that always surprised me is how the smaller cans of tuna are usually less money per ounce. I had to keep reminding my husband of this. Yosefa, too bad about the tuna. It really makes no sense. they also do this in australia. “In Israel, you have to buy however many specified. If you don’t buy enough to get the sale, “. The checkout girl does not remind you of the sale. I always write down how much money I spend for products and in what quantity at which store. Then if there is a special discount, I can just look at my notebook and compare the price.